This document is a technical summary of the published Federal Highway Administration (FHWA) report Long-Term Bridge Performance High Priority Bridge Performance Issues (FHWA-HRT-14-052), available through the National Technical Information Service at www.ntis.gov. This research was conducted as part of the Federal Highway Administration's (FHWA) Long-Term Bridge Performance (LTBP) Program. The LTBP Program is a minimum 20‑year research effort to collect scientific performance field data, from a representative sample of bridges nationwide, that will help the bridge community better understand bridge deterioration and performance. It will be a collection of data‑driven tools including predictive and forecasting models that will enhance the ability of bridge owners to optimize their management of bridges. The objective of this TechBrief is to describe the bridge performance issues that will be studied under the LTBP Program, including how they were identified and prioritized with the assistance of bridge owners and other key stakeholders in the bridge community. It is intended for bridge owners and the bridge community at large (i.e., bridge engineers, bridge inspectors, and bridge asset managers) interested in the activities of the LTBP Program. The performance of any single bridge or component of a bridge is dependent on multiple factors, many of which are closely linked. They include the original design parameters and specifications (bridge type, materials, geometries, load capacities); initial quality of materials and quality of the asbuilt construction; varying conditions of climate, air quality, and soil properties; and corrosion and other deterioration processes. Other factors influencing performance include traffic volumes, counts and weights of truck loads and truck live load impacts, and damage sustained as a result of scour, seismic events, wind, etc. A final critical factor influencing performance is the type, timing, and effectiveness of preventive maintenance, of minor and major rehabilitation actions, and ultimately of replacement actions applied to the bridge. All of these factors combine to affect the condition and operational capacity of the bridge and its various structural components at any point in the life of the bridge. 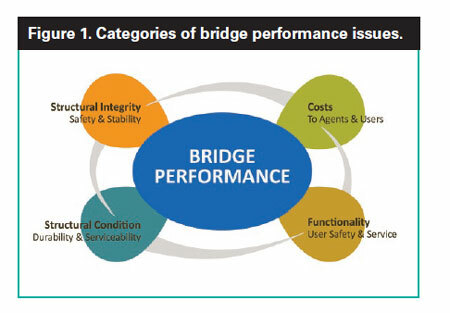 Currently, some important aspects of bridge performance are not well understood, and some of the main performance factors are not well documented because crucial data are not available or are difficult and costly to collect and analyze. The LTBP Program is designed in part to collect critical performance data that are not available elsewhere and merge them with data gathered from available sources. The overall objective of the LTBP Program is to inspect, evaluate, and periodically monitor representative samples of bridges nationwide to collect, document, maintain, and manage high‑quality quantitative performance data over an extended period of time. Much of the data collected under the LTBP Program will be from inspection and testing of in-service bridges. Collection of high-quality quantitative performance data over an extended period of time will require resources and commitment on the part of bridge owners to provide access to their bridges and allow lane closures. These factors magnify the importance of selecting study topics that have great potential for payoff in terms of better, long‑term bridge performance on a widespread scale. Structural condition–durability and serviceability (including fatigue). Costs (to State transportation departments and users). Structural integrity–safety and stability in failure modes. At an early stage in the development phase, three issues were identified for which input from bridge owners was important to the development and implementation of the LTBP Program. First was the need to determine what aspects of bridge performance were most important to the owners and then to determine what gaps existed in owners' understanding of these aspects. That information is the focus of this TechBrief. Second was the need to examine what information data owners currently had for use in their decisionmaking processes and to identify where there were critical gaps in available data and knowledge. That information will be the focus of the upcoming FHWA TechBrief Identifying Long‑Term Bridge Performance Data Needs. Third was to understand bridge owners’ decisionmaking processes and business practices to help identify what products the LTBP Program could develop that would best assist them in managing their bridge programs. That information was used internally by FHWA. The approach selected to collect this information was to hold a series of focus groups across a number of geographically distributed States. The best source of the required information was deemed to be the State transportation departments. Therefore, focus group meetings were designed to allow interviews with a group of bridge inspectors, engineers, and managersfrom each of the selected States. As a result of the meetings, valuable information was obtained on performance issues of concern, data needs, performance measures that the departments of transportation currently use, and what those departments saw as desired outcomes of the program. Organizational structure and processes within the department of transportation relative to bridge funding, design, management, inspection, and maintenance programming. The 5 to 10 most common forms of deterioration, damage, or functional issues faced in maintaining, repairing, or rehabilitating highway bridges. The 5 to 10 most common bridge maintenance,repair, or rehabilitation activities on which the department of transportation expends the most resources, with estimates of man-hours and funds spent on each annually. Figure 2 shows the States where focus group meetings were held in 2008 and 2009. During the development phase of the LTBP Program and even prior to its start, FHWA and the research team sought input on critical aspects of bridge performance from key stakeholders and strived to maintain a continuing dialogue with members of the bridge community. An important element of that dialogue was the discussion of the bridge performance issues that the program could and should study. This dialogue was carried on in workshops and technical conference sessions devoted to LTBP, in briefings and discussions with bridge–related technical committees from the American Association of State Highway and Transportation Officials (AASHTO) and the Transportation Research Board (TRB), and in informal meetings with State transportation department bridge personnel. In January 2007, FHWA, the National Science Foundation, and the University of Nevada—Reno cosponsored a workshop in Las Vegas to develop initial strategies and recommendations for implementing the LTBP Program. The workshop was attended by 46 professionals from State transportation departments, FHWA, industry, and academia. The purpose of the workshop was to gather the collective advice of these experts on how to implement the program and, most important, what they would suggest for the priorities for collection of bridge data. The workshop did not produce recommendations on performance issues to study but did generate a comprehensive list of data that could be collected on the priorities and conditions of bridge elements and materials. See the upcoming report Identifying Long-Term Bridge Performance Data Needs to learn more about the data identified. However, the lists of data recommended for collection clearly indicate an emphasis on the condition of the major elements of the bridge as a focal point of key bridge performance issues. Direct, reliable, timely methods to measure scour. Jointless structures (integral, semi–integral,continuous for live load). Within this range of topics, FHWA research and management personnel were concerned that geotechnical, foundation, and substructure issues had not been adequately captured. Therefore, the FHWA hosted the Workshop to Identify Bridge Substructure Performance Issues in Orlando, FL, during March 2010. FHWA personnel, LTBP Program research team, and approximately 30 invited attendees representing State transportation departments; FHWA headquarters, Federal aid, Federal lands, and research; academia; and consultants met to consider overall bridge performance and identify geotechnical performance metrics that may correspond to good and poor performance. The core of the workshop comprised breakout sessions to discuss three key elements of the program: bridge performance issues (affected by geotechnical factors); data needs and gaps (related to the issues identified); and tools, technology development, and monitoring (related to the data gaps). Approach and bridge interface issues. Material degradation, corrosion, and deterioration issues. Mechanically stabilized earth (MSE) wall material degradation and assessment of wall integrity. FHWA has established an LTBP State Coordinators Group with one key bridge representative from each of the States and Puerto Rico and the District of Columbia. The inaugural meeting of the LTBP State Coordinators was held in September 2011 to familiarize them with the scope and goals of the program and solicit their ideas and feedback on the conduct of the program. The list of high priority performance issues that was current at the time was presented to the group, and the coordinators provided input. The AASHTO Subcommittee on Bridges and Structures (SCOBS) is an important stakeholder of the LTBP Program. Findings of the program that result in potential changes to specifications, inspection methods, bridge management practices, etc. will need to be endorsed by the relevant technical committees as well as the full SCOBS. Each year, FHWA has provided a briefing on the program to the full subcommittee. Also, briefings are frequently given to the relevant technical committees (i.e., T-5, Loads and Load Distribution; T-9, Bridge Preservation; T-11, Research; and T-18, Bridge Management, Evaluation, and Rehabilitation). During these briefings and discussions, the FHWA has received feedback about performance issues of interest or methods for pursuing the research objectives. These groups agreed that the performance issues presented were high priorities to study. The LTBP Program is intended to be a longterm program to collect comprehensive information on bridge performance issues that will support improvements to bridge management practice and lead to improvements in bridge performance. Bridge performance is a multifaceted issue involving performance of materials and protective systems, performance of individual components of the bridge, and performance of the structural system as a whole. Bridge performance is influenced by many factors; some are static or fixed (e.g., design type), and others are variable (e.g., live loadings). The LTBP Program's resources may be inadequate to study every aspect of bridge performance. A basic principle governing the program is that it should serve the needs of bridge owners across the Nation as identified by those bridge owners. Thus, considerable effort was undertaken to solicit input from bridge owners as well as from the bridge community at large on what high priority bridge performance issues should be addressed by the LTBP Program. The State transportation departments, bridge technical committees, and other individuals interviewed also provided input on the types of data that should be collected by the program and on the types of decision support tools that the program should deliver. The result of the focus group meetings and other interviews is a list of 22 high priority bridge performance issues recommended for study under the LTBP Program. Table 1 presents the comprehensive list of topics after considering all input from stakeholders. After discussions among the research team, FHWA, State coordinators, and the TRB LTBP Committee, it was recognized that all topics could not be addressed immediately and the number of topics to be addressed would be constrained by program resources. Therefore, a short list of top priority topics was developed. Table 2 presents the initial six top priority topics recommended for study under the program. As time and resources permit, additional topics may be incorporated into the program. These 6 issues and the majority of the other issues in the list of 22 are all related primarily to the physical condition and the structural integrity of bridges. They represent issues that bridge owners most commonly face in maintaining, repairing, or rehabilitating their bridges and involve the most common maintenance, repair, or rehabilitation activities they need to perform. These performance issues may arise because of certain design and/or construction details or may be the result of or be aggravated by service conditions and loadings. Determining what knowledge and data related to these issues are readily available from other sources. Determining what critical knowledge and data gaps exist and what types of testing and investigation are needed to fill those gaps. Selecting representative samples of bridges that will be the source of the missing knowledge and data. Designing experiments for collection, storage, and analysis of the data. Designing the data infrastructure to store and manage the data. Each of the high priority performance issues will be examined in detail, and the specific data necessary to study the issues will be identified. The results will be published in the upcoming report Identifying Long‑Term Bridge Performance Data Needs. For additional information, contact: Susan Lane, HRDI‑60, (202) 493-3151, susan.lane@dot.gov. Schaefer, V, Maher, A., Hooks, J., and Foden, A. (2013). Summary Report on the FHWA LTBP Workshop to Identify Bridge Substructure Performance Issues: March 4–6, 2010, in Orlando, FL, Report No. FHWAHRT-11-037, Federal Highway Administration, Department of Transportation, McLean, VA.
First Letter Report of the TRB Long-Term Bridge Performance (LTBP) Committee, March 16, 2012. FHWA Response to First Letter Report of the TRB Long-Term Bridge Performance (LTBP) Committee, May 30, 2012. Researchers – This study was performed by Rutgers, the State University of New Jersey; the Virginia Center for Transportation Innovation and Research; Virginia Tech; and Parsons Brinckerhoff. Distribution – This TechBrief is being distributed according to a standard distribution. Direct distribution is being made to the Divisions and Resource Center. Availability – This TechBrief may be obtained from the FHWA Product Distribution Center by e-mail to report.center@fhwa.dot.gov, by fax to (301) 577-1421, by phone to (301) 577-0818, or online at https://www.fhwa.dot.gov/research/tfhrc/programs/infrastructure/structures/ ltbp/pubs.cfm. Notice – This document is disseminated under the sponsorship of the U.S. Department of Transportation in the interest of information exchange. The U.S. Government assumes no liability for the use of the information contained in this document. The U.S. Government does not endorse products or manufacturers. Trademarks or manufacturers' names appear in this report only because they are considered essential to the objective of the document. Quality Assurance Statement – The Federal Highway Administration provides high-quality information to serve Government, industry, and the public in a manner that promotes public understanding. Standards and policies are used to ensure and maximize the quality, objectivity, utility, and integrity of its information. FHWA periodically reviews quality issues and adjusts its programs and processes to ensure continuous quality improvement.